On the tenth anniversary of the International Space Station (ISS), Astronauts Shane Kimbrough (EV3) and Heidemarie Stefanyshyn-Piper (EV1) have conducted the second of four EVAs during STS-126. As with EVA-1, the spacewalk concentrated on the starboard SARJ (Solar Alpha Rotary Joint). The ISS – is the largest spacecraft ever built – was born in Kazakhstan, when Russia launched the Zarya module 10 years ago today. It was soon joined by the Shuttle launched Unity module, as the orbital outpost began its expansion process. Since then, the ISS has grown by 627,000 pounds. The station is truly international, involving NASA, the Russian Federal Space Agency, Canadian Space Agency, Japan Aerospace Exploration Agency, or JAXA, and 11 members of the European Space Agency: Belgium, Denmark, France, Germany, Italy, the Netherlands, Norway, Spain, Sweden, Switzerland and the UK. Many years in the planning before finally taking shape, its design has been reduced from the original plan, but still holds elements that were previously designed for the Russian Mir 2 and US Space Station Freedom. It’s major expansion will continue until at least the end of the shuttle schedule, with major elements such as the S6 truss and Node 3 yet to be launched, alongside other elements like the JAXA exposed research facility for Kibo. The Station will provide vital science and long duration flight experience deep into the next decade, as it grows into its role as a National Laboratory for the United States. Stefanyshyn-Piper and Kimbrough were tasked with Crew and Equipment Translation Aid (CETA) cart relocation, in order to allow for the SSRMS (Space Station Remote Manipulator System) to move to the end of the truss ahead of STS-119’s delivery of the S6 truss segment and solar arrays – before the task of lubricating Canadarm2 Latching End Effector (LEE) A snare bearings. The duo then headed out to the starboard SARJ for the continuation of cleaning and lubrication efforts, and the changeout of several Trundle Bearing Assemblies (TBAs). This effort will continue over the last two EVAs of the mission (and future flights). “EV3 starts with Cover 11 and 12/TBA 12. Once cover 11 and 12 complete, works nadir with cover 13/TBA 1 and cover 14. As time permits, works on single covers,” outlined the SSP EVA FRR (Flight Readiness Review) presentation, though plans continued to be realigned via the sharing of the remaining grease guns – following the incident on EVA-1. Back inside the ISS, new Expedition 18 crew member Sandra Magnus has been busy hooking up the newly arrived Water Recycling System – with the goal of taking samples over the coming days. These samples will be returned to Earth via Endeavour for testing, before the system is used by ISS crewmembers in around 90 days time. Endeavour herself is happily docked to the ISS, with no major issues in work. No impacts have been detected on the orbiter’s WLE IDS (Wing Leading Edge Impact Detection System) – mainly thanks to a new calibration plan that was set prior to launch. 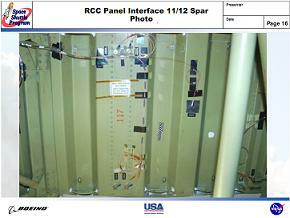 The WLE sensors are located underneath the RCC panels on both of wings. They are used to detect impacts during ascent, allowing for areas of interest to be pinpointed ahead of Flight Day 2’s inspections with the OBSS (Orbiter Boom Sensor System). The sensors are also used on orbit, allowing for an ability for the orbiter to ‘feel’ any MMOD strikes that are a potential threat to the panels during the mission. “Wing Leading Edge sensors had no new reportable triggers. The system is now shutdown until the late inspection,” added the MMT. The WLE IDS has previously noted several “triggers” – which have eventually been cleared from being an impact on the RCC panels, during nearly all of the flights this system has been implemented on since Return To Flight. The triggers have been put down to the sensitivity of the system, which can register ‘ghost’ triggers via the slightest thermal variations that effect the panels on orbit. Under investigation are issues with the OBSS Pan Tilt Unit (PTU) and the docking misalignment during Flight Day 3 (presentations on L2 for both investigations – articles will follow). “Docking mechanism misalignment: Extended free drift softdock period, larger attitude excursion than normal,” noted the current Mission Management Team (MMT) mission status presentation. “Solar arrays and radiators were positioned per flight rules. Power on channel 1A dipped to 60.2 percent, recovered to 100 percent within two orbits. The only specific hardware issue on Endeavour relates to the primary heater on the OMS Crossfeed line. However, the system is working without issue on its secondary system. “OMS Crossfeed Line ‘A’ Heater Failure. Line A heater considered failed. No mission impact with Line B heater operational,” noted the MMT presentation. “Additional testing per MER request confirmed failure. Endeavour is also due to provide a reboost for her host on Flight Day 8 – just past midday Eastern time) – via a 3 fps (feet per second) burn from her VERN jets. The evaluations into a potential conjunction with the Cosmos satellite, Object 2421, is still being tracked for Friday.